In the market for a credit card? If so, it can be hard to figure out which card is best for you. Do you want a travel rewards card? A cash back card? A regular non-rewards credit card? Better yet – what you can qualify for given your personal financial and credit situation? If you feel like you’re trying to complete a multiple choice Math test that you didn’t have a chance to study for, then you’re in luck! We break down the benefits and drawbacks of some of the most popular Capital One cards so that you can quickly compare them and figure out which is right for you. You’ve likely seen commercials about Capital One credit cards before – but do you know much about the company? It’s a bank it is best known for their credit cards, as well as their auto loans, home loans and other banking products. They’re headquartered in McLean, Virginia and are the eighth largest bank in America. In fact, Capital One is ranked on the Fortune 500. It was also the fifth largest credit card issuer in the US. Capital One has a number of great credit card options to choose from whether you have average credit or excellent credit. Here’s all the info you need to figure out which card is best for you. Like travel rewards? 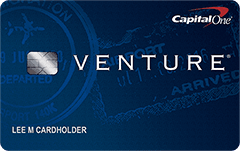 The Capital One Venture Rewards credit card allows you to earn 2 miles for every dollar you spend on all your purchases. In addition, when you first sign up you can earn up to 40,000 bonus miles if you spend $3,000 in the first three months after you open your account. That’s a lot of travel miles. The interest rate for the Venture Reward credit card varies between 12.99% and 22.99% APR and that rate is variable. The exact amount that you will pay in interest will depend on your personal financial and credit situation, as well as the current interest rate. They also charge the same interest rates if you transfer a balance onto your card and they have no balance transfer fee which can run as high as 2% to 3% on other cards. There is also no annual fee for the card for the first year, but after that you pay $59 per year. This card is recommended by Capital One for people with excellent credit or people with credit scores in the range of 750 to 850. The Venture Rewards credit card is a great credit card option since they offer a lucrative bonus for signing up and also two miles for every dollar you spend. Another plus is that they charge a relatively low interest rate range which allows you to potentially pay less interest on your card. That comes in handy if you ever carry a balance on your card. In addition, they offer the first year free without an annual fee. While there is an annual fee in subsequent years, depending on how much you spend on your card, you could make it up with the miles you earn. Another bonus is that their balance transfer rate is the same interest rate as you would pay on regular purchases. Many other cards charge additional interest for balance transfers as well as a balance transfer fee. If you’re planning on transferring a credit card balance – this could be a good card to do it on. Would you rather get cold hard cash than travel miles? 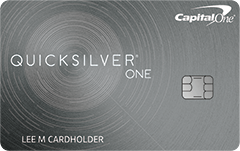 With the Quicksilver﻿﻿ Rewards ﻿﻿card from Capital One you get 1.5% cash back every time you make a purchase. This amount is unlimited and you can also earn $150 bonus cash when you spend $500 within three months after you open your account. They offer a 0% introductory interest rate for the first nine months and then afterwards it goes to 13.99% to 23.99% variable APR. They also offer that same 0% interest rate on balance transfers for the first nine months and then it also goes to the same 13.99% to 23.99% variable APR after that. They do charge a 3% fee on amounts that are transferred onto your card in the first three months, but after that they charge no transfer fee. They also do not charge an annual fee. The card is recommended by Capital One for those with excellent credit. The Quicksilver card is a great card for those who have excellent credit as it has a lot of great benefits. It offers 1.5% cashback and a great bonus of $150 when you spend the relatively low amount of $500 within the first three months. It also has a 0% introductory interest rate which will potentially save you money, especially if you plan on transferring other credit card balances onto the card. Even though you’ll have to pay 3% on those transfers, you will save because you will not have to pay interest on the cards throughout the nine month period. Another bonus is that there is no annual fee – which is perfect for those who don’t use their cards very much and are unlikely to earn back an annual fee via rewards. 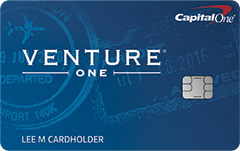 With the VentureOne Rewards card from Capital One you earn 1.25 miles for every dollar you spend every day. When you sign-up, you could earn up to 20,000 bonus miles when you spent $1,000 within the first three months after you open your account. The VentureOne Rewards card also offers an introductory interest rate of 0% APR for the first 12 months and then offers an interest rate of 12.99% to 22.99% variable APR after that. They also offer no transfer fee, but they do not extend the 0% introductory APR to balance transfers and instead charge 12.99% to 22.99% variable APR. 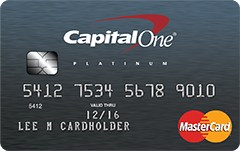 The card has no annual fee and Capital One recommends it for people who have excellent credit. The VentureOne card is similar to the Venture card except there are some important differences. While both cards require that you have excellent credit, the VentureOne card charges a slightly lower interest rate. The VentureOne card also doesn’t charge an annual fee, but the benefits aren’t as good as those offered via the Venture card. For example, you only get the option to earn 20,000 bonus miles rather than 40,000 bonus miles. In addition, you only get 1.25 miles for every dollar you spend rather than 2 miles for every dollar you spend. Which card is better for you will depend on how you use your card. If you use it frequently, you’ll likely quickly make back the annual fee you will pay after your first year of using the Venture card via additional travel rewards. But if you do not use your card as frequently, you might be better off getting a card with no annual fee and still enjoying the great benefits of the VentureOne card. Do you like to dine out? 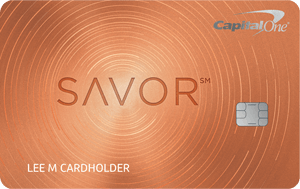 You might consider the Savor Dining Rewards card! The card offers 3% cash back when you’re eating out and 2% cash back on groceries. It offers 1% back on everything else. There is also a $150 bonus that you can earn when you spend $500 in the first 3 months after you open your account. The interest rate on the card varies between 15.49% and 24.49%. They charge the same amount on any balances you transfer to the card and they also charge no foreign transaction fee. In addition to this, they don’t charge an annual fee. This card is recommended by Capital One for people who have excellent credit. It is a great card for those who dine out frequently as they can earn additional cash back on their purchases. Because it doesn’t charge an annual fee those earnings won’t be offset by that fee. However, the card does charge a higher interest rate than some other Capital One card options. Whether this card is right for you will depend on how much you eat out and buy groceries as a percentage of the charges you put on your credit card. If you spend a significant proportion of your credit card purchases on food, then you will end up with more cash back at the end of the month. But if you spend the majority of your money on other purchases, you might be better off getting a rewards card that offers a high cash back percentage on everyday purchases like the Quicksilver card or even the QuicksilverOne card. The QuicksilverOne card is similar to the Quicksilver card but it is aimed at those who have average credit, which is often said to be between 670 and 739. Like the Quicksilver card, you can get 1.5% cash back on all your purchases. But the card does not offer a sign-up bonus similar to the Quicksilver card. The QuicksilverOne card offers a 0% introductory interest rate for the first 9 months that also extends to balance transfers. After that, the interest rate on the card is 24.99% variable APR for both regular purchases and balance transfers. One of the bonuses is that there is no balance transfer fee. Unlike the Quicksilver card, the QuicksilverOne card charges a $39 annual fee. While the QuicksilverOne card might be a good option for people with average credit, the interest rate on the card starts relatively high. Also, it’s not as good as the Quicksilver card if you can qualify for that. Still, the annual fee isn’t terribly high and there is the bonus of being able to earn cash back and also the fact that the card offers 0% APR for the first 9 months on both regular purchases and balance transfers is a real plus. Whether this card is right for you will depend on your personal credit and financial situation and what you spend the majority of your purchases on. If you’re spending most of your money on dining out or buying groceries, you might be better off getting the Premier Dinning card. When you hear the words Platinum card, you might think that you would require near perfect credit to qualify for one. Not the case with the Capital One Platinum card. In fact, you only require average credit in order to qualify. The Platinum card has no annual fee, but offers no useful mileage or cash back rewards cards. It has a 24.99% variable APR on both regular purchases and balance transfers. It also has no transfer fees and no annual fees. If you have average credit and you’re in the market for a low fee non-rewards credit card, then the Platinum card might be right for you. This could especially be the case if you don’t think you’ll use the card enough to earn back the $39 annual fee that you would pay on the QuicksilverOne card. But the Platinum card charges a significant amount in interest. If you struggle with credit and carry a balance on your card, you might be better off with a card with a lower interest rate or, at least, one that offers a low or 0% introductory APR that will save you money. Are you a student? If you are, you’re in luck! The Journey Student Rewards card offers 1% cashback on all your purchase. Plan on paying your credit card on time? Your cash back rewards will be boosted to 1.25% instead. The Journey Student Rewards card charges an interest rate of 24.99% variable APR on regular purchases and on balance transfers. There is no transfer fee and no annual fee. As this is meant for students, they accept applicants who have average credit or even those with little to no credit history. Getting a rewards card with no annual fee for students is a great plus since it can sometimes be difficult to qualify for that kind of card when you’re still going to school and not making a good income. It will help you build your credit and it teaches good credit behaviors – by rewarding you with additional rewards when you pay your bills on time. You can also use all that cash back to pay for your tuition or buy coffee to get you through all those late night studying sessions. One downside is the fact that the interest rate on the card starts relatively high, which could lead some students to get into trouble with their credit cards. This is not a card that you would want to carry a balance on. Are you a business owner? In addition to their great selection of personal credit cards, Capital One also offers a number of business credit card options. Their business credit card brand is called Spark and they offer a number of great features depending on your needs. Spark cash is a great card for your business. You get 2% cash back on everything you buy with it. You also can earn a sign-up bonus of $500 if you spend $4,500 within the first 3 months of opening your card. When it comes to interest rates, they charge a relatively reasonable 17.99% variable APR on regular purchases and balance transfers. There is also no fee for balance transfers. While the card has no annual fee in the first year, they charge a $59 annual fee after that. The card is meant for those with excellent credit. As with many business credit cards, you will likely be required to use your personal credit in order to apply for and get approved for a business credit card unless you have built up considerable business credit. The Spark Cash card is a great option because it offers a very generous 2% cash back. If you spend enough money on your card in the first three months, you’ll also get a great bonus for signing up. The interest rate is reasonable for a business credit card, though you could potentially find lower rates. Whether this card is right for you will depend on your business and how much of a balance you think you’ll be carrying on your business credit card. The Spark Cash Select credit card is similar to the Spark Cash card except it’s less expensive. You’ll pay a lower interest rate you pay and no annual fee. But you pay for that with less rewards. With the Spark Cash Select card, you get only 1.5% cash back on your purchases. You also only get a $200 bonus when you spend $3,000 in your first 3 months. However, there are some benefits you get that you don’t get with the Spark Cash credit card. For example, you get a 0% introductory APR for the first 9 months and then the interest rate is just 13.99% to 21.99% after that. Depending on your personal credit, you could potentially pay less in interest than you would with the Spark Cash card. Alternately, you could end up paying more. While they don’t extend the 0% introductory APR to balance transfers, they charge the same rates on balance transfers and have no transfer fees. There is also no annual fee. The card is recommended for those with excellent personal or business credit. While there are a number of benefits with the Spark Cash Select credit card, there are also some downsides. While the card might end up being cheaper since you don’t have to pay an annual fee, you get a 0% introductory APR, and your interest rate could end up being less than with the Spark Cash card, you miss out on rewards, get a smaller bonus and also could pay more interest depending on your personal financial and credit situation. 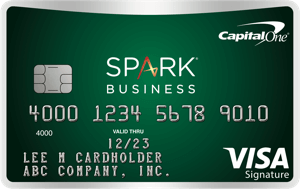 Whether this card is right for you will depend on whether you plan on using your card enough to compensate for the annual fee on the Spark Cash card. Do you travel a lot for work? Would you love a card that makes all that travel cheaper for your business? You might be interested in the Spark Miles card. It gives you 2 miles for every dollar you spend. You can also earn a sign-up bonus of 50,000 miles or $500 in travel if you spend $4,500 in the first three months you have your card. While there is no introductory interest rate, they charge 17.99% on both regular purchases and balance transfers. They charge no fees for balance transfers. There is also no annual fee during the first year though there is a $59 fee after that. This card is recommended for people with excellent personal or business credit. This card has a lot of benefits from the great mileage rewards that you can earn to the amazing sign-up bonus. The interest rate charged is a reasonable rate, but you could potentially qualify for less if you have excellent credit. If you plan on carrying a balance on your card, you might want a card with a lower interest rate. Also, you’ll have to decide if the annual fee makes sense for your business depending on how much you plan on using your card. Your card use might also impact your decision because it impacts whether you would earn a bonus on your card or not. If you don’t spend enough, you might not be able to qualify for the amazing $500 sign-up bonus. If that’s the case, the card might not be as attractive to you. In your dreams we just quit Capital One for Barclay’s. Capital ones interest is 34%, then again Barclays is 7%. From Barclay we get answers from Capital only promises with Barclays we can simple log in on line, with Capitals you have to jump through hoops. I presume that backhanders are playing part in your so fantasic Capital one.